What must a Data Scientist be able to do? Which skills does as Data Scientist need to have? This question has often been asked and frequently answered by several Data Science Experts. In fact, it is now quite clear what kind of problems a Data Scientist should be able to solve and which skills are necessary for that. I would like to try to bring this consensus into a visual graph: a layer model, similar to the OSI layer model (which any data scientist should know too, by the way). I’m giving introductory seminars in Data Science for merchants and engineers and in those seminars I always start explaining what we need to work out together in theory and practice-oriented exercises. Against this background, I came up with the idea for this layer model. Because with my seminars the problem already starts: I am giving seminars for Data Science for Business Analytics with Python. So not for medical analyzes and not with R or Julia. So I do not give a general knowledge of Data Science, but a very specific direction. A Data Scientist must deal with problems at different levels in any Data Science project, for example, the data access does not work as planned or the data has a different structure than expected. A Data Scientist can spend hours debating its own source code or learning the ropes of new DataScience packages for its chosen programming language. Also, the right algorithms for data evaluation must be selected, properly parameterized and tested, sometimes it turns out that the selected methods were not the optimal ones. Ultimately, we are not doing Data Science all day for fun, but for generating value for a department and a data scientist is also faced with special challenges at this level, at least a basic knowledge of the expertise of that department is a must have. 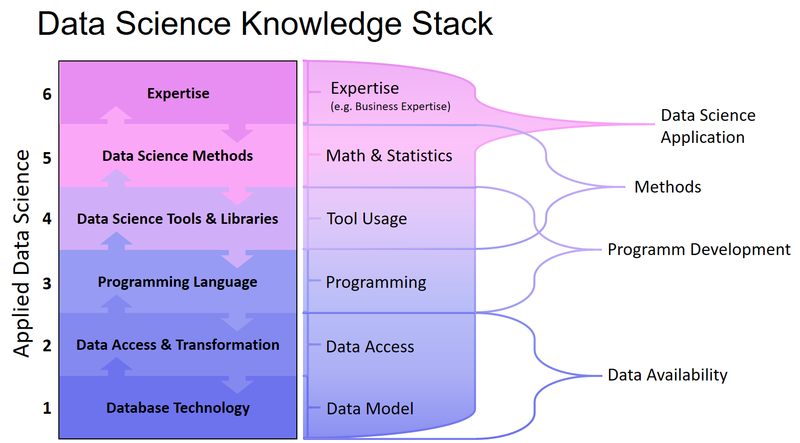 With the Data Science Knowledge Stack, I would like to provide a structured insight into the tasks and challenges a Data Scientist has to face. 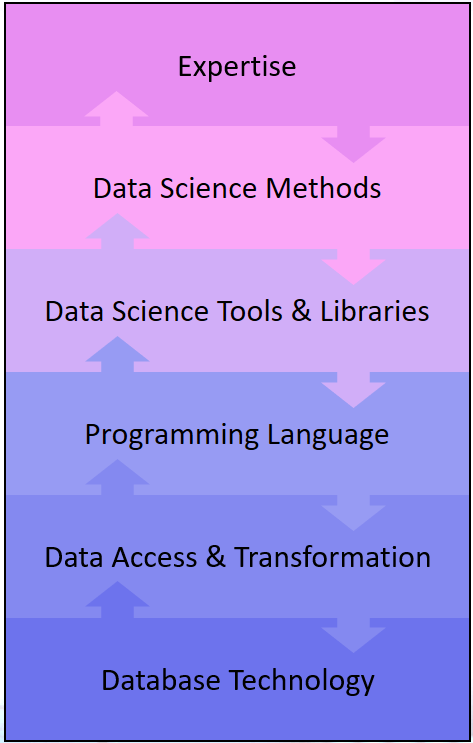 The layers of the stack also represent a bidirectional flow from top to bottom and from bottom to top, because Data Science as a discipline is also bidirectional: we try to answer questions with data, or we look at the potentials in the data to answer previously unsolicited questions. A Data Scientist works with data which is rarely directly structured in a CSV file, but usually in one or more databases that are subject to their own rules. In particular, business data, for example from the ERP or CRM system, are available in relational databases, often from Microsoft, Oracle, SAP or an open source alternative. A good Data Scientist is not only familiar with Structured Query Language (SQL), but is also aware of the importance of relational linked data models, so he also knows the principle of data table normalization. A data scientist has to cope with different database systems and has to master at least SQL – the quasi-standard for data processing. If data are given in a database, Data Scientists can perform simple (and not so simple) analyzes directly on the database. But how do we get the data into our special analysis tools? To do this, a Data Scientist must know how to export data from the database. For one-time actions, an export can be a CSV file, but which separators and text qualifiers should be used? Possibly, the export is too large, so the file must be split. If there is a direct and synchronous data connection between the analysis tool and the database, interfaces like REST, ODBC or JDBC come into play. Sometimes a socket connection must also be established and the principle of a client-server architecture should be known. Synchronous and asynchronous encryption methods should also be familiar to a Data Scientist, as confidential data are often used, and a minimum level of security is most important for business applications. Many datasets are not structured in a database but are so-called unstructured or semi-structured data from documents or from Internet sources. And again we have interfaces, a frequent entry point for Data Scientists is, for example, the Twitter API. Sometimes we want to stream data in near real-time, let it be machine data or social media messages. This can be quite demanding, so the data streaming is almost a discipline with which a Data Scientist can come into contact quickly. Programming languages ​​are tools for Data Scientists to process data and automate processing. Data Scientists are usually no real software developers and they do not have to worry about software security or economy. However, a certain basic knowledge about software architectures often helps because some Data Science programs can be going to be integrated into an IT landscape of the company. The understanding of object-oriented programming and the good knowledge of the syntax of the selected programming languages ​​are essential, especially since not every programming language is the most useful for all projects. At the level of the programming language, there is already a lot of snares in the programming language that are based on the programming language itself, as each has its own faults and details determine whether an analysis is done correctly or incorrectly: for example, whether data objects are copied or linked as reference, or how NULL/NaN values ​​are treated. Once a data scientist has loaded the data into his favorite tool, for example, one of IBM, SAS or an open source alternative such as Octave, the core work just began. However, these tools are not self-explanatory and therefore there is a wide range of certification options for various Data Science tools. 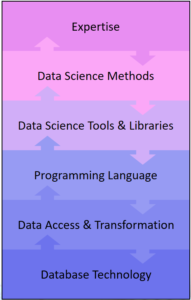 Many (if not most) Data Scientists work mostly directly with a programming language, but this alone is not enough to effectively perform statistical data analysis or machine learning: We use Data Science libraries (packages) that provide data structures and methods as a groundwork and thus extend the programming language to a real Data Science toolset. Such a library, for example Scikit-Learn for Python, is a collection of methods implemented in the programming language. The use of such libraries, however, is intended to be learned and therefore requires familiarization and practical experience for reliable application. When it comes to Big Data Analytics, the analysis of particularly large data, we enter the field of Distributed Computing. Tools (frameworks) such as Apache Hadoop, Apache Spark or Apache Flink allows us to process and analyze data in parallel on multiple servers. These tools also provide their own libraries for machine learning, such as Mahout, MLlib and FlinkML. A Data Scientist is not simply an operator of tools, he uses the tools to apply his analysis methods to data he has selected for to reach the project targets. These analysis methods are, for example, descriptive statistics, estimation methods or hypothesis tests. Somewhat more mathematical are methods of machine learning for data mining, such as clustering or dimensional reduction, or more toward automated decision making through classification or regression. Machine learning methods generally do not work immediately, they have to be improved using optimization methods like the gradient method. A Data Scientist must be able to detect under- and overfitting, and he must prove that the prediction results for the planned deployment are accurate enough. Special applications require special knowledge, which applies, for example, to the fields of image recognition (Visual Computing) or the processing of human language (Natural Language Processiong). At this point, we open the door to deep learning. Data Science is not an end in itself, but a discipline that would like to answer questions from other expertise fields with data. For this reason, Data Science is very diverse. Business economists need data scientists to analyze financial transactions, for example, to identify fraud scenarios or to better understand customer needs, or to optimize supply chains. Natural scientists such as geologists, biologists or experimental physicists also use Data Science to make their observations with the aim of gaining knowledge. Engineers want to better understand the situation and relationships between machinery or vehicles, and medical professionals are interested in better diagnostics and medication for their patients. In order to support a specific department with his / her knowledge of data, tools and analysis methods, every data scientist needs a minimum of the appropriate skills. Anyone who wants to make analyzes for buyers, engineers, natural scientists, physicians, lawyers or other interested parties must also be able to understand the people’s profession. While the Data Science pioneers have long established and highly specialized teams, smaller companies are still looking for the Data Science Allrounder, which can take over the full range of tasks from the access to the database to the implementation of the analytical application. However, companies with specialized data experts have long since distinguished Data Scientists, Data Engineers and Business Analysts. 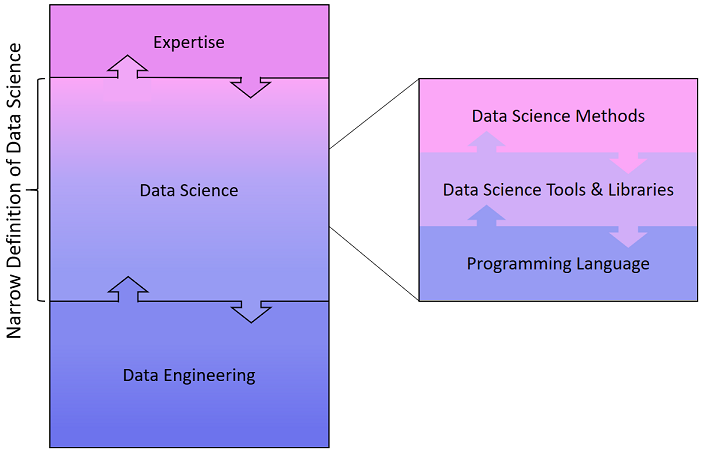 Therefore, the definition of Data Science and the delineation of the abilities that a data scientist should have, varies between a broader and a more narrow demarcation. 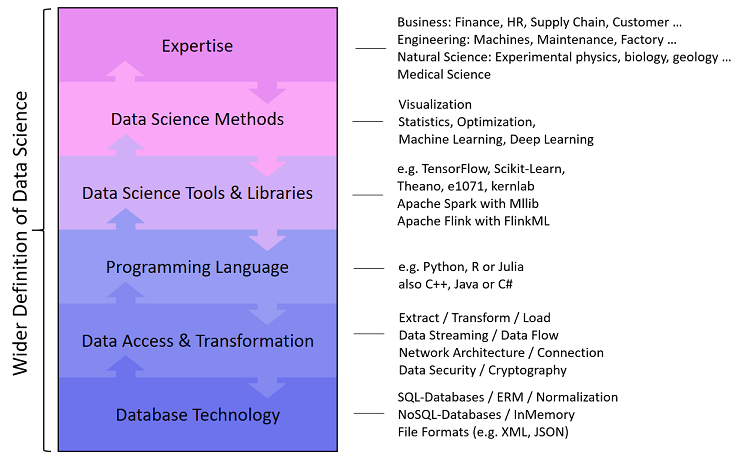 In my experience, DataScience is not that narrow, the task spectrum covers more than just the core area. This misunderstanding comes from Data Science courses and – for me – I should point to the overall picture of Data Science again and again. In courses and seminars, which want to teach Data Science as a discipline, the focus will of course be on the core area: programming, tools and methods from mathematics & statistics. Der Data Leader Day (www.dataleaderday.com) am 09.11.2017 im Spreespeicher in Berlin ist das Event für praktische Umsetzungsempfehlungen für die Big Data und Data Science von führenden Anwendern aus der Industrie – unsere Data Leader. Vor allem die hochrangigen Referenten ziehen dabei Teilnehmer aus der ganzen DACH-Region an, um neue Kontakte zu knüpfen und wichtige Impulse für die eigene digitale Weiterentwicklung zu erhalten. Es handelt sich dabei jedoch nicht um eine anonyme Veranstaltung, sondern um ein Event mit der richtigen Konfiguration zum Fachsimpeln und Netzwerken in einer persönlichen Atmosphäre. Der Data Leader Day 2017 bringt Nachwuchskräfte aus der Big Data Welt und Unternehmen zusammen. Dafür richten wir einen Young Professional Roundtable ein, an dem wir das Zusammentreffen organisieren. Sie haben bereits erste Erfahrung als Data Scientist gesammelt und möchten sich weiterentwickeln? Neben dem umfangreichen Vortragsprogramm präsentieren sich Firmenvertreter und Recruiter auf dem Data Leader Day in Berlin. Dort haben Sie die Möglichkeit, mehr über die Aufgaben, Arbeitsweise und Karrierewege als Data Scientist in Gesprächen mit Entscheidern zu erfahren. Connected Industry, der Hauptorganisator der Veranstaltung, vergibt für Young Professionals 30 Tickets zum Preis von 50 € (inkl. Verpflegung, Event-Teilnahme und -unterlagen) für Nachwuchskräfte. Bewerben Sie sich jetzt mit einer kurzen Vorstellung zu Ihrer Person und einem Lebenslauf als PDF-Datei via E-Mail an info@dataleaderday.com. Der Data Leader Day am 09.11.2017 im Berliner Spreespeicher ist das Premium-Event, das sich mit den Möglichkeiten und Lösungen rund um die Digitalisierung, Big Data und Industrie 4.0 beschäftigt. Mit dabei sind u.a. Dr. Eberhard Kurz (CIO, Deutsche Bahn), Dr. Andreas Braun (Head of Global Data & Analytics, Allianz), Steffen Winkler (Vice President, Bosch Rexroth), Dr. Michael Müller-Wünsch (CIO, Otto Group), Helen Arnold (President SAP Data Network) und Peter Krause (Geschäftsführer, First Sensor). Alle diejenigen, die es mit dem aufmerksamen Lesen bis an diese Stelle geschafft haben, dürfen sich über einen 25%igen Rabatt auf alle Tickets für den Data Leader Day 2017 freuen. Das funktioniert so: Rufen Sie sich die Ticket-Sektion auf www.dataleaderday.com auf oder klicken Sie auf diesen Direktlink zum Ticketverkauf. Volunteers für den Data Leader Day gesucht! Wir suchen motivierte Studierende und Promovierende, die uns bei der Durchführung der Konferenz als Volunteer unterstützen. Dabei erhaltet ihr einen Überblick über aktuelle Praxis- und Forschungsthemen, persönliche Kontakte zu den Entscheidern der deutschen Digitalwirtschaft sowie einen Einblick in den Ablauf hinter den Kulissen einer Konferenz. Holen Sie sich Anregungen aus unterschiedlichen Branchen und treffen Sie führende Persönlichkeiten der deutschen Digitalwirtschaft sowie aus den Digital bzw. Data Labs der traditionellen Industrie. Was muss ich als Volunteer machen? Um als Volunteer am Data Leader Day 2017 teilzunehmen, bewerbt Euch bis zum 15.10.2017 unter info@dataleaderday.com. Wir geben euch zeitnah Bescheid, ob ihr dabei seid. Wir freuen uns auf euch! Was muss ein Data Scientist können? Diese Frage wurde bereits häufig gestellt und auch häufig beantwortet. In der Tat ist man sich mittlerweile recht einig darüber, welche Aufgaben ein Data Scientist für Aufgaben übernehmen kann und welche Fähigkeiten dafür notwendig sind. Ich möchte versuchen, diesen Konsens in eine Grafik zu bringen: Ein Schichten-Modell, ähnlich des OSI-Layer-Modells (welches übrigens auch jeder Data Scientist kennen sollte). Ich gebe Einführungs-Seminare in Data Science für Kaufleute und Ingenieure und bei der Erläuterung, was wir in den Seminaren gemeinsam theoretisch und mit praxisnahen Übungen erarbeiten müssen, bin ich auf die Idee für dieses Schichten-Modell gekommen. Denn bei meinen Seminaren fängt es mit der Problemstellung bereits an, ich gebe nämlich Seminare für Data Science für Business Analytics mit Python. Also nicht beispielsweise für medizinische Analysen und auch nicht mit R oder Julia. Ich vermittle also nicht irgendein Data Science, sondern eine ganz bestimmte Richtung. Ein Data Scientist muss bei jedem Data Science Vorhaben Probleme auf unterschiedlichsten Ebenen bewältigen, beispielsweise klappt der Datenzugriff nicht wie geplant oder die Daten haben eine andere Struktur als erwartet. Ein Data Scientist kann Stunden damit verbringen, seinen eigenen Quellcode zu debuggen oder sich in neue Data Science Pakete für seine ausgewählte Programmiersprache einzuarbeiten. Auch müssen die richtigen Algorithmen zur Datenauswertung ausgewählt, richtig parametrisiert und getestet werden, manchmal stellt sich dabei heraus, dass die ausgewählten Methoden nicht die optimalen waren. Letztendlich soll ein Mehrwert für den Fachbereich generiert werden und auch auf dieser Ebene wird ein Data Scientist vor besondere Herausforderungen gestellt. 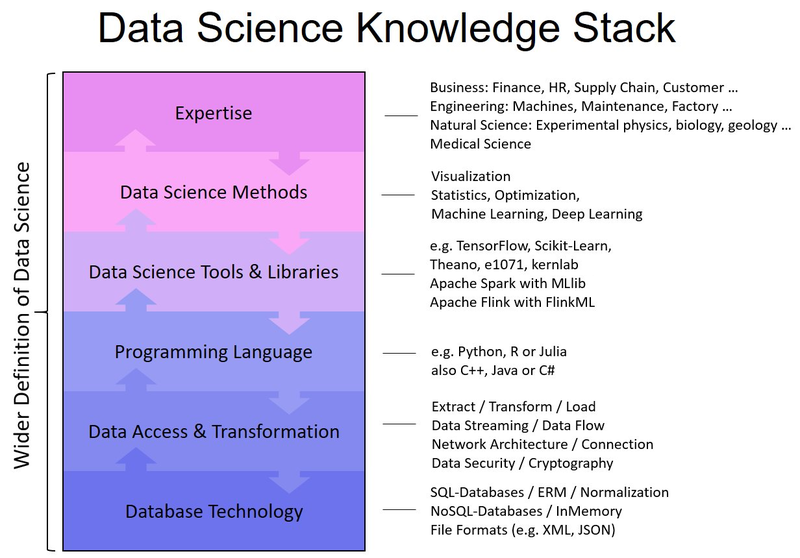 Mit dem Data Science Knowledge Stack möchte ich einen strukturierten Einblick in die Aufgaben und Herausforderungen eines Data Scientists geben. Die Schichten des Stapels stellen zudem einen bidirektionalen Fluss dar, der von oben nach unten und von unten nach oben verläuft, denn Data Science als Disziplin ist ebenfalls bidirektional: Wir versuchen gestellte Fragen mit Daten zu beantworten oder wir schauen, welche Potenziale in den Daten liegen, um bisher nicht gestellte Fragen zu beantworten. Ein Data Scientist arbeitet im Schwerpunkt mit Daten und die liegen selten direkt in einer CSV-Datei strukturiert vor, sondern in der Regel in einer oder in mehreren Datenbanken, die ihren eigenen Regeln unterliegen. Insbesondere Geschäftsdaten, beispielsweise aus dem ERP- oder CRM-System, liegen in relationalen Datenbanken vor, oftmals von Microsoft, Oracle, SAP oder eine Open-Source-Alternative. Ein guter Data Scientist beherrscht nicht nur die Structured Query Language (SQL), sondern ist sich auch der Bedeutung relationaler Beziehungen bewusst, kennt also auch das Prinzip der Normalisierung. Ein Data Scientist muss mit unterschiedlichen Datenbanksystemen zurechtkommen und mindestens SQL – den Quasi-Standard für Datenverarbeitung – sehr gut beherrschen. Liegen Daten in einer Datenbank vor, können Data Scientists einfache (und auch nicht so einfache) Analysen bereits direkt auf der Datenbank ausführen. Doch wie bekommen wir die Daten in unsere speziellen Analyse-Tools? Hierfür muss ein Data Scientist wissen, wie Daten aus der Datenbank exportiert werden können. Für einmalige Aktionen kann ein Export als CSV-Datei reichen, doch welche Trennzeichen und Textqualifier können verwendet werden? Eventuell ist der Export zu groß, so dass die Datei gesplittet werden muss. Soll eine direkte und synchrone Datenanbindung zwischen dem Analyse-Tool und der Datenbank bestehen, kommen Schnittstellen wie REST, ODBC oder JDBC ins Spiel. Manchmal muss auch eine Socket-Verbindung hergestellt werden und das Prinzip einer Client-Server-Architektur sollte bekannt sein. Auch mit synchronen und asynchronen Verschlüsselungsverfahren sollte ein Data Scientist vertraut sein, denn nicht selten wird mit vertraulichen Daten gearbeitet und ein Mindeststandard an Sicherheit ist zumindest bei geschäftlichen Anwendungen stets einzuhalten. Viele Daten liegen nicht strukturiert in einer Datenbank vor, sondern sind sogenannte unstrukturierte oder semi-strukturierte Daten aus Dokumenten oder aus Internetquellen. Auch hier haben wir es mit Schnittstellen zutun, ein häufiger Einstieg für Data Scientists stellt beispielsweise die Twitter-API dar. Manchmal wollen wir Daten in nahezu Echtzeit streamen, beispielsweise Maschinendaten. Dies kann recht anspruchsvoll sein, so das Data Streaming beinahe eine eigene Disziplin darstellt, mit der ein Data Scientist schnell in Berührung kommen kann. Programmiersprachen sind für Data Scientists Werkzeuge, um Daten zu verarbeiten und die Verarbeitung zu automatisieren. Data Scientists sind in der Regel keine richtigen Software-Entwickler, sie müssen sich nicht um Software-Sicherheit oder -Ergonomie kümmern. Ein gewisses Basiswissen über Software-Architekturen hilft jedoch oftmals, denn immerhin sollen manche Data Science Programme in eine IT-Landschaft integriert werden. Unverzichtbar ist hingegen das Verständnis für objektorientierte Programmierung und die gute Kenntnis der Syntax der ausgewählten Programmiersprachen, zumal nicht jede Programmiersprache für alle Vorhaben die sinnvollste ist. Auf dem Level der Programmiersprache gibt es beim Arbeitsalltag eines Data Scientists bereits viele Fallstricke, die in der Programmiersprache selbst begründet sind, denn jede hat ihre eigenen Tücken und Details entscheiden darüber, ob eine Analyse richtig oder falsch abläuft: Beispielsweise ob Datenobjekte als Kopie oder als Referenz übergeben oder wie NULL-Werte behandelt werden. Hat ein Data Scientist seine Daten erstmal in sein favorisiertes Tool geladen, beispielsweise in eines von IBM, SAS oder in eine Open-Source-Alternative wie Octave, fängt seine Kernarbeit gerade erst an. Diese Tools sind allerdings eher nicht selbsterklärend und auch deshalb gibt es ein vielfältiges Zertifizierungsangebot für diverse Data Science Tools. Viele (wenn nicht die meisten) Data Scientists arbeiten überwiegend direkt mit einer Programmiersprache, doch reicht diese alleine nicht aus, um effektiv statistische Datenanalysen oder Machine Learning zu betreiben: Wir verwenden Data Science Bibliotheken, also Pakete (Packages), die uns Datenstrukturen und Methoden als Vorgabe bereitstellen und die Programmiersprache somit erweitern, damit allerdings oftmals auch neue Tücken erzeugen. Eine solche Bibliothek, beispielsweise Scikit-Learn für Python, ist eine in der Programmiersprache umgesetzte Methodensammlung und somit ein Data Science Tool. Die Verwendung derartiger Bibliotheken will jedoch gelernt sein und erfordert für die zuverlässige Anwendung daher Einarbeitung und Praxiserfahrung. Geht es um Big Data Analytics, also die Analyse von besonders großen Daten, betreten wir das Feld von Distributed Computing (Verteiltes Rechnen). Tools (bzw. Frameworks) wie Apache Hadoop, Apache Spark oder Apache Flink ermöglichen es, Daten zeitlich parallel auf mehren Servern zu verarbeiten und auszuwerten. Auch stellen diese Tools wiederum eigene Bibliotheken bereit, für Machine Learning z. B. Mahout, MLlib und FlinkML. Ein Data Scientist ist nicht einfach nur ein Bediener von Tools, sondern er nutzt die Tools, um seine Analyse-Methoden auf Daten anzuwenden, die er für die festgelegten Ziele ausgewählt hat. Diese Analyse-Methoden sind beispielweise Auswertungen der beschreibenden Statistik, Schätzverfahren oder Hypothesen-Tests. Etwas mathematischer sind Verfahren des maschinellen Lernens zum Data Mining, beispielsweise Clusterung oder Dimensionsreduktion oder mehr in Richtung automatisierter Entscheidungsfindung durch Klassifikation oder Regression. Maschinelle Lernverfahren funktionieren in der Regel nicht auf Anhieb, sie müssen unter Einsatz von Optimierungsverfahren, wie der Gradientenmethode, verbessert werden. Ein Data Scientist muss Unter- und Überanpassung erkennen können und er muss beweisen, dass die Vorhersageergebnisse für den geplanten Einsatz akkurat genug sind. Spezielle Anwendungen bedingen spezielles Wissen, was beispielsweise für die Themengebiete der Bilderkennung (Visual Computing) oder der Verarbeitung von menschlicher Sprache (Natural Language Processiong) zutrifft. Spätestens an dieser Stelle öffnen wir die Tür zum Deep Learning. Data Science ist kein Selbstzweck, sondern eine Disziplin, die Fragen aus anderen Fachgebieten mit Daten beantworten möchte. Aus diesem Grund ist Data Science so vielfältig. Betriebswirtschaftler brauchen Data Scientists, um Finanztransaktionen zu analysieren, beispielsweise um Betrugsszenarien zu erkennen oder um die Kundenbedürfnisse besser zu verstehen oder aber, um Lieferketten zu optimieren. Naturwissenschaftler wie Geologen, Biologen oder Experimental-Physiker nutzen ebenfalls Data Science, um ihre Beobachtungen mit dem Ziel der Erkenntnisgewinnung zu machen. Ingenieure möchten die Situation und Zusammenhänge von Maschinenanlagen oder Fahrzeugen besser verstehen und Mediziner interessieren sich für die bessere Diagnostik und Medikation bei ihren Patienten. Damit ein Data Scientist einen bestimmten Fachbereich mit seinem Wissen über Daten, Tools und Analyse-Methoden ergebnisorientiert unterstützen kann, benötigt er selbst ein Mindestmaß an der entsprechenden Fachexpertise. Wer Analysen für Kaufleute, Ingenieure, Naturwissenschaftler, Mediziner, Juristen oder andere Interessenten machen möchte, muss eben jene Leute auch fachlich verstehen können. Während die Data Science Pioniere längst hochgradig spezialisierte Teams aufgebaut haben, suchen beispielsweise kleinere Unternehmen eher den Data Science Allrounder, der vom Zugriff auf die Datenbank bis hin zur Implementierung der analytischen Anwendung das volle Aufgabenspektrum unter Abstrichen beim Spezialwissen übernehmen kann. Unternehmen mit spezialisierten Daten-Experten unterscheiden jedoch längst in Data Scientists, Data Engineers und Business Analysts. Die Definition für Data Science und die Abgrenzung der Fähigkeiten, die ein Data Scientist haben sollte, schwankt daher zwischen der breiteren und einer engeren Abgrenzung. In der beruflichen Praxis sieht Data Science meiner Erfahrung nach so nicht aus, das Aufgabenspektrum umfasst mehr als nur den Kernbereich. Dieser Irrtum entsteht in Data Science Kursen und auch in Seminaren – würde ich nicht oft genug auf das Gesamtbild hinweisen. In Kursen und Seminaren, die Data Science als Disziplin vermitteln wollen, wird sich selbstverständlich auf den Kernbereich fokussiert: Programmierung, Tools und Methoden aus der Mathematik & Statistik. Is Data Science the new Statistics? However, despite all the challenges that I will need to overcome in answering those questions I will try to do it. I will refer to ideas from several reputable sources, in which I will also tell you: what is in the data science that I am really fascinated about? What is magical in this creation of statistics and computer science that I am drawn to? “When physicists do mathematics, they’re don’t say they’re doing “number science”. They’re doing math. If you’re analyzing data, you’re doing statistics. You can call it data science or informatics or analytics or whatever, but it ‘s still statistics. If you say that one kind of data analysis is statistics and another kind is not, you’re not allowing innovation. We need to define the field broadly. You may not like what some statisticians do. You may feel they don’t share your values. They may embarrass you. But that shouldn’t lead us to abandon the term “statistics”. “There ‘s so, much that goes on with data that is about computing, not statistics. I do think it would be fair to consider statistics (which includes sampling, experimental design, and data collection as well as data analysis (which itself includes model building, visualization, and model checking as well as inference)) as a subset of data science. . . .”. So maybe people from computer science are right. Maybe I should go and study programming and forget about expanding my knowledge in statistics? After all, we all know that computer science always had much bigger funding and having MSc computer science was always like a magic star for employers. What should I do? Let me research further. Is the data size important to distinguish between data science and statistics? Going back to the “Let us own data science” article we can read that a statistician, Hollerith, invented the punched card reader to allow e cient compilation of a US census, the first elements of machine learning. So, no, machine learning is not an invention of computer scientists. It was well known for statistician for decades already. What about different techniques used in DOE (Design of Experiments) or sampling methods to decrease the sample size. If the data used by statisticians would be only small they wouldn’t have to discover methods such PCA (Principle component analysis) or dimensionality reduction techniques. So, no, data can be big and/or small for statisticians, so what is the difference between data science and statistics and what department should I choose? When I spoke to computer scientists they try to convince me to choose computer science department. Their reasons being that there are many different programmes that I need to know to deal with large datasets. For instance: Java, Hadoop, SQL, Python, and much more. Moreover, programming can only be taught to the best standard through computer science courses Is it true? Can’t we do the same calculations using statistical software such as R, SAS or even Matlab? But on the other hand, doesn’t the newest technology always work faster? And if so, wouldn’t be better to use the newest technology when we program and write loops? But, I don’t want to underestimate the effort made by statisticians and data analyst over last 50 years in developing statistical programmes. Their efforts have resulted in the emergence of today’s technology. Early statistical packages such as SPSS or Minitab (from 1960’s) allowed to develop more advanced programmes having roots in mini computer era such as STATA or my favourite R which in turn allowed progress to advanced technology even further and create Python, Hadoop, SQL and so on. Becker and Chambers (with S) and later Ihaka, Gentleman, and members of the R Core team (with R) worked on developing the statistical software. These names should be convincing about how powerful statistical programming languages can be. Many operations that we can do in Hadoop or SQL we can also do easily in R.
Okay, so my reasoning that some statisticians work on computer science department is right, as well as there exists subject like computational statistics, so maybe I should go for computer science department but study statistics. If I am right then above confession was a critical moment. The time when mathematical statistics become more inferential and computational statistics concentrated more on predictive statistics. Applied statisticians working on predictive analytics that are more interested in applying the knowledge rather than developing long proofs decided to move on computer science department. Additionally, the following is crucial discussion made by Leo Biermann in his paper published in Statistical Science titled “Statistical modelling: the two cultures”. It enables us to understand and differentiate views from both types of statistician, namely mathematical and statistical. A publicly available training data set involving, for each observation, a list of (possibly many) feature measurements, and a class label for that observation. A set of enrolled competitors whose common task is to infer a class prediction rule from the training data. Kaggle competitions are not only training platforms for newbies like me but also very challenging statistical competitions where experienced statisticians can win “pocket money”. A famous example is the Netflix Challenge where the common task was to predict Netflix user movie selection. The winning team (which included ATT Statistician Bob Bell) won 1 mln dollars. We can really see that data science is a subject that demands skills from both computer science and statistics. So, it is another confirmation for me that it is the best time to change department for my postgraduate study, that is, to study statistics on computer science department. I will quickly go through all of them using my Ebola research example, this required using machine learning on time series data. The most demanding part. Many people told me before starting this project that: collecting, cleaning, wrangling and preparing data take 60% of all the time that you need to spend on data science project. I didn’t realise how much this 60% means in real time. I didn ‘t realise that the 60 percent will take so much time and that after this I will be exhausted. Exhausted but ready for the next step. This point is actually part of the first one, or maybe just like many other things in statistics: everything is one huge connected bunch.Data that you can find can be very nice, well behaving, written in CSV or JSON or any other format file that you can quickly download and use, but what if not? What if your data is ‘dirty’and not stored as a file (e.g. only appear on a website)? What if data is coded? Do you need to decode it? The even bigger challenge, but what a fun? You need to know a few different programming languages or least as I do know a little bit of R, a little bit of Python, quite well Tableau and Excel. So you can use different program in different scenarios or for different tasks. For example, using Panda to do EDA and ggplot 2 to do data vis. Graphs are pretty, right? If you are still reading my article, I bet you know what is heat map, spatial vis in big cities or different infographics. Surely, I would like to highlight, that we respect only the ones that are not only pretty but also valid. Nevertheless, time that is required to create these visualisations is another matter. The data modelling, finally? I don’t need to say a lot about this. All forms of inferential and predictive analytic are allowed and accepted. My favourite part, not the end yet. All the conferences and meetups that I can attend on. All the seminars where we all present our current projects. After graduation, I will be graduated Statistician. Even more, I will be a mathematical statistician whom mostly during degree dealt with inferential statistics. On the other hand, winning data science scholarship gave me exposure to predictive analytic which I highly enjoyed. Therefore, for my next stage, I will just change my department and concentrate more on predictive analytic. There are many statisticians working on computer science department. They possess both statistical knowledge and advanced software engineering skills, they are called data scientists. It would be a pleasure for me to join them. I don’t mind if it will be MSc. Computer Science, MSc. Data Science, MSc. Big Data or whatever the name will be. I do mind to have sufficient exposure to deal with “dirty” data using statistical modelling and machine learning using modern technology. This is what data science is for me. Maybe for you, it will be something else. Maybe you will be more satisfied with expanding massively programming skills. But for me, programming is a tool, modern technology is my friend and my bread and butter will be predictive analytic. 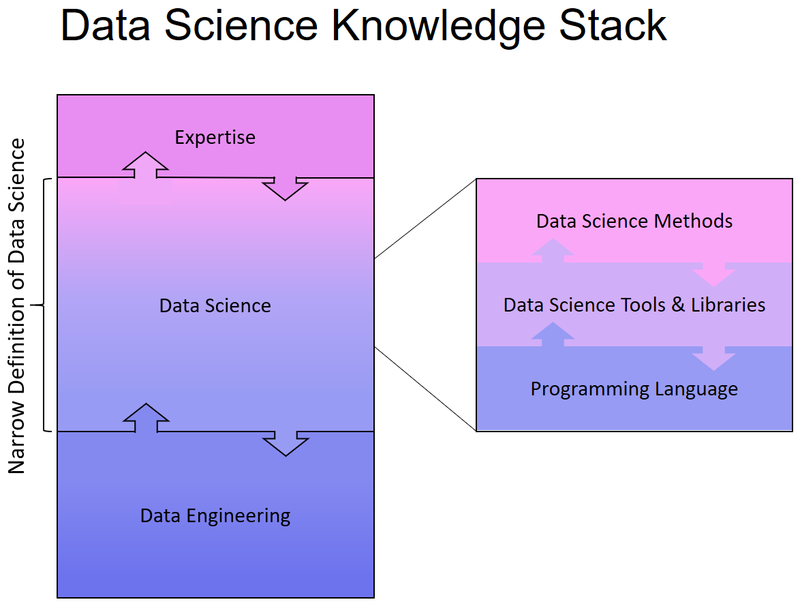 Yanir Seroussi: What is data Science? https://data-science-blog.com/wp-content/uploads/2017/09/data-science-data-scientist-data-engineer.jpg 1125 1688 Marta Fajlhauer https://www.data-science-blog.com/wp-content/uploads/2016/09/data-science-blog-logo.png Marta Fajlhauer2017-09-07 09:14:092017-09-07 10:42:04Is Data Science the new Statistics? Healthcare providers have a plethora of important but sensitive data. Medical records include a diverse set of data such as basic demographics, diagnosed illnesses, and a wealth of clinical information such as lab test results. For patients with chronic diseases, there could be a long and detailed history of data available on a number of health indicators due to the frequency of visits to a healthcare provider. Information from medical records can often be combined with outside data as well. For example, a patient’s address can be combined with other publicly available information to determine the number of surgeons that practice near a patient or other relevant information about the type of area that patients reside in. With this rich data about a patient as well as their surroundings, models can be built and trained to predict many outcomes of interest. One important area of interest is models predicting disease progression, which can be used for disease management and planning. For example, at Fresenius Medical Care (where we primarily care for patients with chronic conditions such as kidney disease), we use a Chronic Kidney Disease progression model that can predict the trajectory of a patient’s condition to help clinicians decide whether and when to proceed to the next stage in their medical care. Predictive models can also notify clinicians about patients who may require interventions to reduce risk of negative outcomes. For instance, we use models to predict which patients are at risk for hospitalization or missing a dialysis treatment. These predictions, along with the key factors driving the prediction, are presented to clinicians who can decide if certain interventions might help reduce the patient’s risk. One challenge is that the healthcare industry is far behind other sectors in terms of adopting the latest technology and analytics tools. This does present some challenges, and data scientists should be aware that the data infrastructure and development environment at many healthcare companies will not be at the bleeding edge of the field. However it also means there are a lot of opportunities for improvement, and even small simple models can yield vast improvements over current methods. Another challenge in the healthcare sector arises from the sensitive nature of medical information. Due to concerns over data privacy, it can often be difficult to obtain access to data that the company has. For this reason, data scientists considering a position at a healthcare company should be aware of whether there is already an established protocol for data professionals to get access to the data. If there isn’t, be aware that simply getting access to the data may be a major effort in itself. Finally, it is important to keep in mind the end-use of any predictive model. In many cases, there are very different costs to false-negatives and false-positives. A false-negative may be detrimental to a patient’s health, while too many false-positives may lead to many costly and unnecessary treatments (also to the detriment of patients’ health for certain treatments as well as economy overall). Education about the proper use of predictive models and their limitations is essential for end-users. Finally, making sure the output of a predictive model is actionable is important. Predicting that a patient is at high-risk is only useful if the model outputs is interpretable enough to explain what factors are putting that patient at risk. Furthermore, if the model is being used to plan interventions, the factors that can be changed need to be highlighted in some way – telling a clinician that a patient is at risk because of their age is not useful if the point of the prediction is to lower risk through intervention. The future holds a lot of promise for data science in healthcare. Wearable devices that track all kinds of activity and biometric data are becoming more sophisticated and more common. Streaming data coming from either wearables or devices providing treatment (such as dialysis machines) could eventually be used to provide real-time alerts to patients or clinicians about health events outside of the hospital. Currently, a major issue facing medical providers is that patients’ data tends to exist in silos. There is little integration across electronic medical record systems (both between and within medical providers), which can lead to fragmented care. This can lead to clinicians receiving out of date or incomplete information about a patient, or to duplication of treatments. Through a major data engineering effort, these systems could (and should) be integrated. This would vastly increase the potential of data scientists and data engineers, who could then provide analytics services that took into account the whole patients’ history to provide a level of consistency across care providers. Data workers could use such an integrated record to alert clinicians to duplications of procedures or dangerous prescription drug combinations.